The pins are normally held a HIGH by the activated internal pull-up resistors and forced to low via the ground pin by the encoder resp. switch. So you can check the voltage on the signal pins, they should be at 3.3V when the encoder is not connected and either 0V or 3.3V when the encoder is connected, depending on the state it is in. I have no experience neither with the ramps-fd nor with marlin kimbra, but I have used the Tiny OLED successfully with an Arduino Due using Andrews modified RAMPS 1.4. 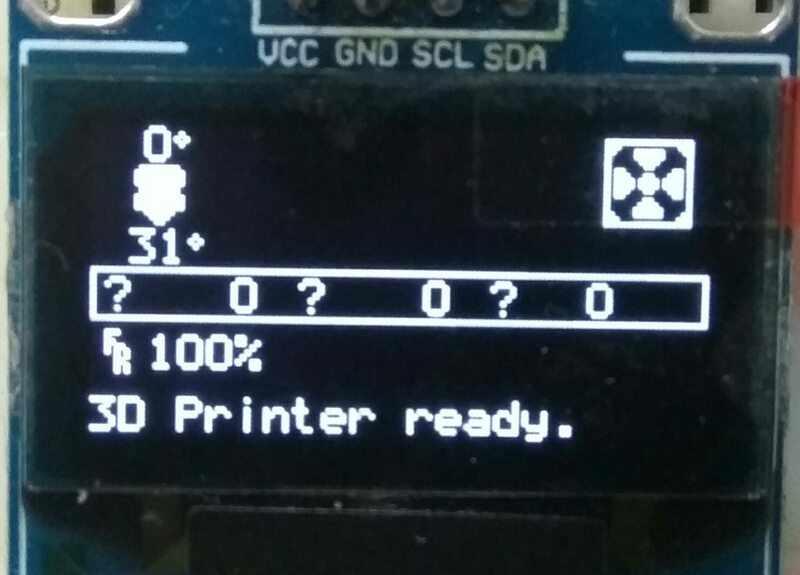 Can you post a photo of your Tiny OLED and how it is connected to the ramps-fd? What would need to be edited in Repetier-firmware to get this to work properly? Thanks for linking me to that. I had enable the #define U8GLIB_SSD1306 and sd but my oled stucked in menu, not responding to encoder. The x,y and z is keep flashing as shown in the attached picture.Did I missed anything on tweaking the Marlin firmware? I'm using Marlin 1.1.0-RC8. My oled and encoder is working fine( tested with example sketches). I still use an older version of Marlin, but from what I read, the blinking coordinates just mean that the corresponding axes have not been homed yet. So that part would be normal in your case. As for the non responding rotary encoder, I assume that there is some problem in the pin assignment. Check out your values for BTN_EN1, BTN_EN2 and BTN_ENC (probably defined in pins_RAMPS.h) and verify them with your wiring. // Generic support for SSD1306 / SH1106 OLED based LCDs. This will not compile. I'm sure I am doing something wrong. My apologies as I get lost on really complex code for the Arduino etc. I suspect I do not have these line entries in the correct place in the pins file. Lastly, if this matters. I am not using a buzzer. Edited 1 time(s). Last edit at 05/18/2017 03:00PM by Twmaster. Are you really sure that you have U8GLIB_SSD1306 defined? And not U8GLIB_SH1106? I use the latter one for the 1.3" displays, the former for 0.96" displays. Please post the compiler output, so that we can see the error messages. Arduino: 1.8.2 (Mac OS X), Board: "Arduino/Genuino Mega or Mega 2560, ATmega2560 (Mega 2560)"
Edited 1 time(s). Last edit at 05/19/2017 11:24AM by Twmaster. Somehow your last message does not fit well with your initial version, where you use U8GLIB_SSD1306 and define it in Configuration.h. Where does SSD1306_OLED_I2C_CONTROLLER come from and where is it defined? And the way you are you using #elif seems rather suspicious to me. Why not just #if and use #elif to replace the following #if ? The example I was using is in the last post by ilo. As I think I said in my initial post I'm sure I am doing something wrong. Ok, I understand. So it's probably best, I simply show you my changes for making my TINYOLED work on Marlin 1.1.x. The added lines are those that are indicated with a "+", the other lines are just showing the context where the changes were made. Thank you again. After work I'm going to blow away my current Marlin folder and create a new from the Zipped file. I'll report back my results. I had the OLED working. Now to beat the encoder into submission. Still not compiling. But new errors. 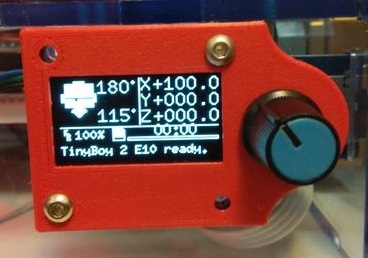 Also, in the code segments you posted I do nto have any listings at all for the "tinyboy" LCD. I downloaded the 1.1.x version and it's compiled. I have to go take care of some personal business and will upload the firmware to the board when I return and report the results. And I am happy to report it mostly works. The only real issue I have is with the encoder. You have to turn the thing three clicks to get it to move to the next position on the menu. The encoder also seems to work backwards from what I expected. But it now works. The rest I hope can be fixed via tweaking. Thank you again. I am grateful. too your liking. Hope that helps to resolve the remaining problems. That does solve it for me. Perfect! Some tweaking on the menu steps and it now works as I prefer. I've added the buzzer and need to complete the configuration of my Prusa-ish printer. This was a big hurdle to cross. I want to thank you for posting this project. Thank you for the kind help and also thanks to all who contributed to this. 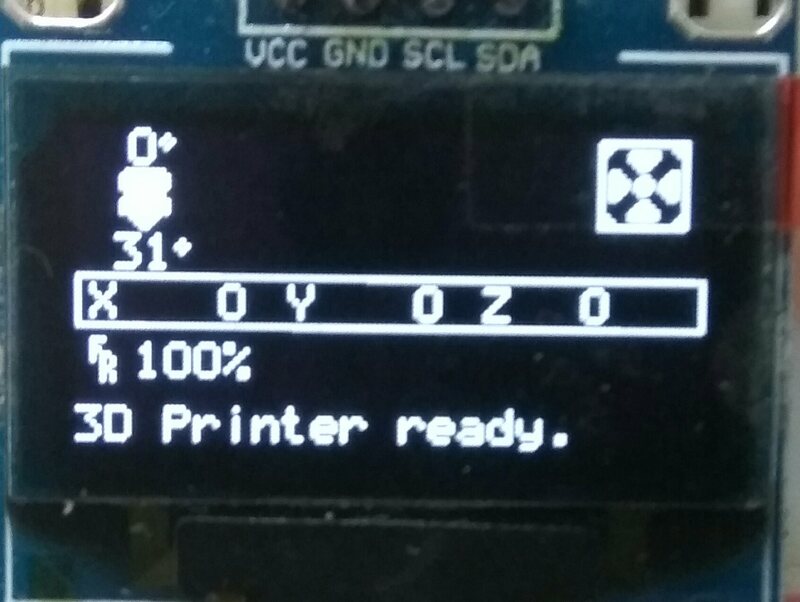 I really dig these little OLED displays and use them extensively through my projects. I even prefer them over the common 1602 and 2004 LCDs for text. I'll post the settings to configure this later this week once I can sit down and sort it all out into all the steps needed. Edited 1 time(s). Last edit at 06/19/2017 07:24PM by Twmaster. Edited 1 time(s). Last edit at 07/19/2017 10:29PM by fredchan. Next upgrade - a 2.42" OLED display ? I already have a 2.42" OLED working. However that one you link on FeeBay will not work. I have 2 and I've tried. They claim it's also I2C but nobody can seem to get that to actually work as I2C. that would help me to understand the code in the scad file?